Home » Forums » Trip Planning » Disney Cruise Line » Online check-in completed! Yesterday DCL check-in opened up for our 10/1 cruise on the Wonder. 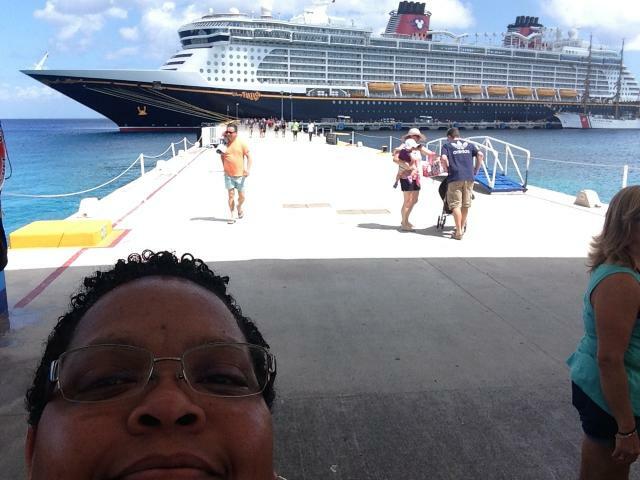 This is a double dip cruise - 2 days at Castaway Cay! Your check-in date depends on how many previous DCL cruises you've been on. There's one group (Platinum level) that had already checked in before me. Was disappointed to see that all the cabanas were gone for both days and there was no availability for the Palo brunch on the sea day. They are offering a second brunch on the last day at Castaway Cay but who wants to give up beach time??!! I was able to book Palo for dinner on night 4 - pirate night - argh - should be done with dinner in time for the fireworks. So looking forward to this cruise - more relaxing with 5 nights - plus no Nausau - only Key West! Wohoo! That means you're getting close! I just booked my excursions for our September 14th cruise on the Dream. I think you'll really enjoy Palo. We did dinner there on Pirate night too. The food was awesome as was the dining experience. We finished in plenty of time to be back on our verandah for the fireworks! This trip we're trying dinner at Remy on Pirate Night. It is supposedly a 3 hr dining experience, so I booked the 6:00 reservation to ensure we had time to get back for the fireworks! All of the Castaway Cay cabana's were already gone for us too. We booked the personal watercraft adventure again. We had so much fun last time! Can't wait to swap stories when we all get back! I am looking forward to hitting Castaway Cay twice on the same trip. This time I am bringing my resume'. Also going to Cay West is going to be a blast too. I've already started ordering new door magnets! It sounds like you two are going to have a blast. NHShorty. I'm sure you and Bill will have another wonderful time. Sounds great! Wish I was going! I have a couple of questions about the logistics of our transition from the AKL to the DCL terminal. I thought others may find some humor or get some valuable information as I come up to speed on our travel plan in public on the board. I know our plan calls for us to drive ourselves in our rental car from the AKL to Port Canaveral. And that we will be stopping somewhere, most likely at the Hess gas station near BW, to purchase some adult beverages for the cruise. Once at Port Canaveral, the plan calls for me to drop you off with our luggage, containing the recently purchased adult beverages, at the DCL terminal. I will then gas up the rental car somewhere and return it to the agency's Port Canaveral location. Then I will take the rental car agency's shuttle bus back to the DCL terminal. 1. Will you be able to check in my luggage without me being physically present? 2. Are we going to go through the check in process separately or are you going to wait for me to return from dropping off the car? 3. Is it possible for me to park the rental car for a short while at the DCL terminal, so we can check in together, and then go return the car? 4. And, as usual, I have forgotten how are we getting to MCO to fly home after the cruise? Another option is for both of us to drop the car and to shuttle our stuff back to the terminal. All members of the party have to be present to check in. Your check-in date depends on how many previous DCL cruises you've been on. There's one group (Platinum level) that had already checked in before me. Was disappointed to see that all the cabanas were gone for both days and there was no availability for the Palo brunch on the sea day. They are offering a second brunch on the last day at Castaway Cay but who wants to give up beach time??!! This concerns me. We will be FIRST time DCL cruisers in February. Should I go ahead and not get my hope up for Brunch or Dinner at Palo??? JMed, not to worry - DCL holds out reservations for first time cruisers! When you get onboard, head to the area designated for dinner reservations/changes. They'll be able to help you and let you know what's available. If there's nothing available for some reason (highly unlikely), let them know you'd like to be on a waitlist. There are always folks that change their minds. How long is your cruise? Which ship are you sailing on? Since NHShorty posted her effusive response, I have received further information. When we get to the DCL terminal, there is a sort of curb-side baggage check in. Our bags will be checked in while I am still there. So NHShorty will not be stuck watching over our luggage whilst I return the rental car. Once I get back we will check in together. Yes, kathys, love is grand. WHEW! I was a little nervous. Surely they can't keep first timers from enjoying all the benefits. It's the main reason we forked out the extra $$$ for the Disney cruise!!! We will be on the Dream for 4 nights. It's Blondie's first cruise and we thought 4 would be perfect for her. If she loves it, which I am sure she will, there will be more to come! JMed - a 4 day cruise on the Dream sounds wonderful! My recommendation would be to try to book your Palo reservation for night 4 - that way you'll get to experience each of the 3 rotational restaurants. It's also a great way to end your cruise! Sounds like a great trip! I'm already looking forward to hearing about it when you get back. Sounds like you have a fantastic trip planned I think I'm going to have to look into this cruise business!!! 1 thing I would like to know if anybody has the answer, if I ever did a Disney cruise there would be me and my mam does anybody know how this would work because obviously we don't want to share a bed and stereotypical cruises tend to be couple related and wondered what is was like for a non couple trip????? I believe you can request a room with two twin beds? If not, the couch in the room pulls out into a bed and there is a pull down bed from the ceiling too. There is a curtain you pull between the bed and couch that allows privacy. It's not only couples. I actually saw quite a few mom/daughters and believe it or not dad/daughters! Hi Amy! When the Magic and Wonder were first launched, they were fitted with two twin beds that could be configured to a king bed. When they launched the bigger ships (Dream and Fantasy) they switched to queen size beds. The Magic now has queen beds as the standard since their renovation. But - there are other options for adults traveling together who don't want to share a bed. Depending upon the category of stateroom you choose, there are pull down berths and convertible sofas. The sofas don't pull out like a sleep sofa - they flip over - the sofa back becomes the bed. The sofa bed was what I slept on for 5 cruises with my sister and nephew. It was very comfortable! Hope this helps! Thanks I'm pleased to hear this I love the idea of a cruise but all the ones we have from the UK are very couple related!!! im so pleased to hear that Disney isn't that way!!! thanks nhshorty that's great info I love the idea of a cruise might have to start dropping hints for 2015!!! haha looking forward to the TR!!!! I agree. The 4th night on a 4 nighter is when we book our adults only restaurant reservations too. We get to eat in all the dining rooms and we miss the Pirate Night meal that is served in all three dining rooms that night. Good advice NHShorty! Thanks for the tip!!! I will keep that in mind! !